Liczba stron: 306 Jest to ujednolicona liczba stron, która ułatwi Ci porównanie długości książek. Każda strona Legimi to 200 słów. 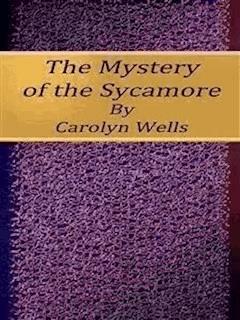 The Mystery of the Sycamore written by an American writer and poet Carolyn Wells. This book is one of many works by her. It was published in 1921. Now republish in ebook format. We believe this work is culturally important in its original archival form. While we strive to adequately clean and digitally enhance the original work, there are occasionally instances where imperfections such as blurred or missing pages, poor pictures or errant marks may have been introduced due to either the quality of the original work. Despite these occasional imperfections, we have brought it back into print as part of our ongoing global book preservation commitment, providing customers with access to the best possible historical reprints. We appreciate your understanding of these occasional imperfections, and sincerely hope you enjoy reading this book. As the character of a woman may be accurately deduced from her handkerchief, so a man’s mental status is evident from the way he opens his mail. Curtis Keefe, engaged in this daily performance, slit the envelopes neatly and laid the letters down in three piles. These divisions represented matters known to be of no great interest; matters known to be important; and, third, letters with contents as yet unknown and therefore of problematical value. The first two piles were, as usual, dispatched quickly, and the real attention of the secretary centred with pleasant anticipation on the third lot. As no further pearls of wisdom fell from the lips of the engrossed reader of letters, the stenographer gave him a round-eyed glance and then continued her work. Curtis Keefe was, of course, called Curt by his intimates, and while it may be the obvious nickname was brought about by his short and concise manner of speech, it is more probable that the abbreviation was largely responsible for his habit of curtness. This was only one of several equally sound bits of advice from the same source, and as Keefe had an eye single to the glory of self-advancement, he kept all these things and pondered them in his heart. The result was that ten years of association with Lawyer Appleby had greatly improved the young man’s manner, and though still brief of speech, his curtness had lost its unpleasantly sharp edge and his courtesy had developed into a dignified urbanity, so that though still Curt Keefe, it was in name only. “What’s the pretty letter all about, Curtie?” asked the observant stenographer, who had noticed his third reading of the short missive. “You’ll probably answer it soon, and then you’ll know,” was the reply, as Keefe restored the sheet to its envelope and took up the next letter. Genevieve Lane produced her vanity-case, and became absorbed in its possibilities. “Huh!” and Genevieve tossed her pretty head, patted her curly ear-muffs, and proceeded with her work. Samuel Appleby’s beautiful home graced the town of Stockfield, in the western end of the Commonwealth of Massachusetts. Former Governor Appleby was still a political power and a man of unquestioned force and importance. It was fifteen years or more since he had held office, and now, a great desire possessed him that his son should follow in his ways, and that his beloved state should know another governor of the Appleby name. And young Sam was worthy of the people’s choice. Himself a man of forty, motherless from childhood, and brought up sensibly and well by his father, he listened gravely to the paternal plans for the campaign. But there were other candidates, and not without some strong and definite influences could the end be attained. Wherefore, Mr. Appleby was quite as much interested as his secretary in the letter which was in the morning’s mail. “Any word from Sycamore Ridge?” he asked, as he came into the big, cheerful office and nodded a kindly good-morning to his two assistants. “Yes, and a good word,” returned Keefe, smiling. “It says: ‘Come.’” The secretary’s attitude toward his employer, though deferential and respectful, was marked by a touch of good-fellowship—a not unnatural outgrowth of a long term of confidential relations between them. Keefe had made himself invaluable to Samuel Appleby and both men knew it. So, as one had no desire to presume on the fact and the other no wish to ignore it, serenity reigned in the well-ordered and well-appointed offices of the ex-governor. Even the light-haired, light-hearted and light-headed Genevieve couldn’t disturb the even tenor of the routine. If she could have, she would have been fired. Though not a handsome man, not even to be called distinguished looking, Samuel Appleby gave an impression of power. His strong, lean face betokened obdurate determination and implacable will. Its deep-graven lines were the result of meeting many obstacles and surmounting most of them. And at sixty-two, the hale and hearty frame and the alert, efficient manner made the man seem years younger. “You know the conditions on which Wheeler lives in that house?” Appleby asked, as he looked over the top of the letter at Keefe. “The whole tribe?” asked Keefe, briefly. “Yes, sir,” said Genevieve, reaching for her vanity-box. “And where do I come in?” asked Genevieve, who had been an interested listener. “Yes, sir,” and the blue eyes turned from him and looked absorbedly into a tiny mirror, as Genevieve contemplated her pleasant pink-and-whiteness. Her vanity and its accompanying box were matters of indifference to Mr. Appleby and to Keefe, for the girl’s efficiency and skill outweighed them and her diligence and loyalty scored one hundred per cent. Appleby’s fetish was efficiency. He had found it and recognized it in his secretary and stenographer and he was willing to recompense it duly, even generously. Wherefore the law business of Samuel Appleby, though carried on for the benefit of a small number of clients, was of vast importance and productive of lucrative returns. At present, the importance was overshadowed by the immediate interest of a campaign, which, if successful would land the second Appleby in the gubernatorial chair. This plan, as yet not a boom, was taking shape with the neatness and dispatch that characterized the Appleby work. Young Sam was content to have the matter principally in his father’s hands, and things had reached a pitch where, to the senior mind, the coöperation of Daniel Wheeler was imperatively necessary. And, therefore, to Wheeler’s house they must betake themselves. “What do you know about the Wheeler business, kid?” Keefe inquired, after Mr. Appleby had left them. Genevieve leaned back in her chair, her dimpled chin moving up and down with a pretty rhythm as she enjoyed her chewing-gum, and gazed at the ceiling beams. Appleby’s offices were in his own house, and the one given over to these two was an attractive room, fine with mahogany and plate glass, but also provided with all the paraphernalia of the most up-to-date of office furniture. There were good pictures and draperies, and a wood fire added to the cheer and mitigated the chill of the early fall weather. Sidling from her seat, Miss Lane moved over to a chair near the fire. Sammy did turn up, and not long after the conversation young Appleby strolled into the office. Though still looked upon as a boy by his father, the man was of huge proportions and of an important, slightly overbearing attitude. Somewhat like his parent in appearance, young Sam, as he was always called, had more grace and ease, if less effect of power. He smiled genially and impartially; he seemed cordial and friendly to all the world, and he was a general favorite. Yet so far he had achieved no great thing, had no claim to any especial record in public or private life. At forty, unmarried and unattached, his was a case of an able mentality and a firm, reliable character, with no opportunity offered to prove its worth. A little more initiative and he would have made opportunities for himself; but a nature that took the line of least resistance, a philosophy that believed in a calm acceptance of things as they came, left Samuel Appleby, junior, pretty much where he was when he began. If no man could say aught against him, equally surely no man could say anything very definite for him. Yet many agreed that he was a man whose powers would develop with acquired responsibilities, and already he had a following. “Yes; this afternoon,” and the secretary looked up inquiringly. “Haven’t seen her for years, but probably, yes. But that’s nothing to you. You’re working for me, you see.” Appleby’s glance was direct, and Keefe understood. “I’ll go home if you say so,” Genevieve piped up, a little crisply. “And a good plan,” Keefe nodded his satisfaction. “Oh, well,” and bridling with offended pride, Genevieve sought refuge in her little mirror. Miss Lane flashed an indignant glance and then proceeded to go on with her work. “Hasn’t Wheeler tried for a pardon all this time?” Keefe asked. “Let up, Keefe; I’ve said I can’t tell you that part—you’ll get your instructions in good time. And, look here, I don’t mean for you to make love to the girl. In fact, I’m told she has a suitor. But you’re just to give her a little song and dance about my suitability for the election, and then adroitly persuade her to use her powers of persuasion with her stubborn father. For he will be stubborn—I know it! And there’s the mother of the girl . . . tackle Mrs. Wheeler. Make her see that my father was justified in the course he took—and besides, he was more or less accountable to others—and use as an argument that years have dulled the old feud and that bygones ought to be bygones and all that. “Depends on what sort of woman Mrs. Wheeler is,” Keefe mused. “I’m not a mischief-maker,” said the girl, pouting playfully, for she was not at all afraid of Sam Appleby. “Hear the child orate!” exclaimed Sam, gazing at the enthusiastic little face, as Genevieve voiced her views. “I will remember,” and Genevieve pretended to took cherubic. For Samuel Appleby to pay a visit to Daniel Wheeler was of itself an astounding occurrence. The two men had not seen each other since the day, fifteen years ago, when Governor Appleby had pardoned the convicted Wheeler, with a condition, which, though harsh, had been strictly adhered to. They had never been friends at heart, for they were diametrically opposed in their political views, and were not of similar tastes or pursuits. But they had been thrown much together, and when the time came for Wheeler to be tried for forgery, Appleby lent no assistance to the case. However, through certain influences brought to bear, in connection with the fact that Mrs. Wheeler was related to the Applebys, the governor pardoned the condemned man, with a conditional pardon. Separated ever since, a few letters had passed between the two men, but they resulted in no change of conditions. As the big car ran southward through the Berkshire Hills, Appleby’s thoughts were all on the coming meeting, and the scenery of autumn foliage that provoked wild exclamations of delight from Genevieve and assenting enthusiasm from Keefe left the other unmoved. An appreciative nod and grunt were all he vouchsafed to the girl’s gushing praises, and when at last they neared their destination he called her attention to a tall old sycamore tree standing alone on a ridge not far away. “Historic to the Wheelers,” was the grim reply, and then Mr. Appleby again relapsed into silence and spoke no further word until they reached the Wheeler home. A finely curved sweep of driveway brought them to the house, and the car stopped at the south entrance. The door did not swing open in welcome, and Mr. Appleby ordered his chauffeur to ring the bell. This brought a servant in response, and the visiting trio entered the house. It was long and low, with many rooms on either side of the wide hall that went straight through from south to north. The first room to the right was a large living-room, and into this the guests were shown and were met by a grave-looking man, who neither smiled nor offered a hand as his calm gaze rested on Samuel Appleby. Indeed, the two men stared at one another, in undisguised curiosity. Each seemed to search the other’s face for information as to his attitude and intent. Wheeler gave a start and pulled himself together. As if awaiting the call, a girl came quickly in from the hall followed by an older woman. Introductions followed, and if there was an air of constraint on the part of the host the ladies of the family showed none. Sunny-faced Maida Wheeler, with her laughing brown eyes and gold brown hair, greeted the visitors with charming cordiality, and her mother was equally kind and courteous. Genevieve Lane’s wise and appraising eyes missed no point of appearance or behavior. Yet only a most meticulous critic could discern anything more than true hospitality in the attitude of Mrs. Wheeler or Maida. The latter took Genevieve to the room prepared for her and chatted away in girlish fashion. “Have you lived here so long?” Genevieve was alert for information. It was fifteen years ago that the pardon had been granted. But as Maida merely assented and then changed the subject, Miss Lane was far too canny to ask further questions. With a promptness not entirely due to chance, the stenographer came downstairs dressed for dinner some several minutes before the appointed hour. Assuming her right as a guest, she wandered about the rooms. The south door, by which they had entered, was evidently the main entrance, but the opposite, or north door, gave on to an even more beautiful view, and she stepped out on the wide veranda and gazed admiringly about. The low ridge nearby formed the western horizon, and the giant sycamore, its straight branches outlined against the fading sunset, was impressive and a little weird. She strolled on, and turned the corner the better to see the ridge. The veranda ran all round the house, and as she went on along the western side, she suddenly became aware of a silent figure leaning against a pillar at the southwest corner. “It is so quiet it frightens me,” she said to Daniel Wheeler, as she neared him. “Do you think so?” and the unmistakable note of disappointment in the man’s tone caused Genevieve to look up in astonishment. “Well, perhaps it will,” he added quickly. “Are you an authority on trees?” Wheeler spoke without a smile. The tone was courteous, but the whole air of the man was so melancholy, his cheerfulness so palpably assumed, that Genevieve felt sorry for him, as well as inordinately curious to know what was the matter. But Genevieve Lane was sometimes under the spell of the Imp of the Perverse. With no reason for her foolish insistence save a whim, Genevieve was amazed to see the look of fury that came over her host’s face. When Miss Lane was excited, she was quite apt to lose her head, and speak in thoughtless fashion. But Mr. Wheeler didn’t seem to notice her informality of speech. He only stared at her as if he couldn’t quite make her out, and then he suddenly seemed to lose interest in her or her wishes, and with a deep sigh, he turned away, and fell into the same brooding posture as when she had first approached him. But though Genevieve listened for the answer, none came. Dinner was a delightful occasion. Daniel Wheeler, at the head of his own table, was a charming host, and his melancholy entirely disappeared as the talk ran along on subjects grave or gay, but of no personal import. Appleby, too, was entertaining, and the two men, with Mrs. Wheeler, carried on most of the conversation, the younger members of the party being by what seemed common consent left out of it. Genevieve looked about the dining-room, with a pleased interest. She dearly loved beautiful appointments and was really imagining herself mistress of just such a house, and visioning herself at the head of such a table. The long room stretched from north to south, parallel with the hall, though not adjoining. The table was not in the centre, but toward the southern end, and Mr. Wheeler, at the end near the windows, had Keefe and Miss Lane on either side of him. Appleby, as guest of honor, sat at Mrs. Wheeler’s right, and the whole effect was that of a formal dinner party, rather than a group of which two were merely office employés. The two girls, followed by Keefe, took possession of a group of chairs near Mrs. Wheeler, while the two older men sat apart, and soon became engrossed in their own discussions. Nor was it long before Samuel Appleby and his host withdrew to a room which opened on to that same south veranda, and which was, in fact, Mr. Wheeler’s den. Outwardly placid, but almost consumed with curiosity, Curt Keefe changed his seat for one nearer the window of the den. He hoped to hear the discussion going on inside, but was doomed to disappointment, for though the murmuring of the voices was audible, the words were not distinct, and Keefe gathered only enough information to be sure that there was a heated argument in progress and that neither party to it was inclined to give in a single point. Of course, he decided, the subject was the coming election campaign, but the details of desired bargaining he could not gather. Moreover, often, just as he almost heard sentences of interest, the chatter of the girls or some remark of Mrs. Wheeler’s would drown the voices of the men in the room. One time, indeed, he heard clearly: “When the Sycamore on the ridge goes into Massachusetts——” but this was sheer nonsense, and he concluded he must have misunderstood. Later, they all forgathered in the living-room and there was music and general conversation. Genevieve Lane proved herself decidedly entertaining, and though Samuel Appleby looked a little amusedly at his stenographer, he smiled kindly at her as he noticed that she in no way overstepped the bounds of correct demeanor. She had called it nonsense at the time, but she was beginning to see the truth of it. She was careful that her every word and act should be correct, and she was most decidedly doing as she liked. She made good with Mrs. Wheeler and Maida with no trouble at all; but she felt, vaguely, that Mr. Wheeler didn’t like her. This she set about to remedy. “Bless my soul, what do you mean?” asked Wheeler, puzzled at the girl’s manner. Now the girl had truly wonderful magnetic charm, and even staid old Dan Wheeler was not insensible to the note of longing in her voice, the simple, honest admission of her hopes. “Of course you will, little one,” he returned, kindly. “I’ve heard that whatever one wants, one gets, provided the wish is strong enough.” He spoke directly to her, but his gaze wandered as if his thoughts were far away. “Do you really believe that?” Genevieve’s big blue eyes begged an affirmation.